Vineyards stretch across the hillsides in long, parallel lines. Their curves show the contour of the earth as hills rise and sink underneath them. A few forgotten grapes still cling to some vines, their skin withered and frosted with ice, their leaves all but gone. Others are pruned down almost to the ground, clean and crisp, ready to rest until spring coaxes them back to life. I walk on old paths between the fields, rising and falling with the hillsides, slipping between clusters of houses and small towns. The land feels almost empty. The streets are quiet. Nothing moves but my steps and a few distant workers slowly walking down the lines, cutting old summer vines away on the slopes under Barbaresco. The wine is famous here, bottled and shipped around the world, swirled in cups, smelled, and tasted by people more refined than I will ever be. 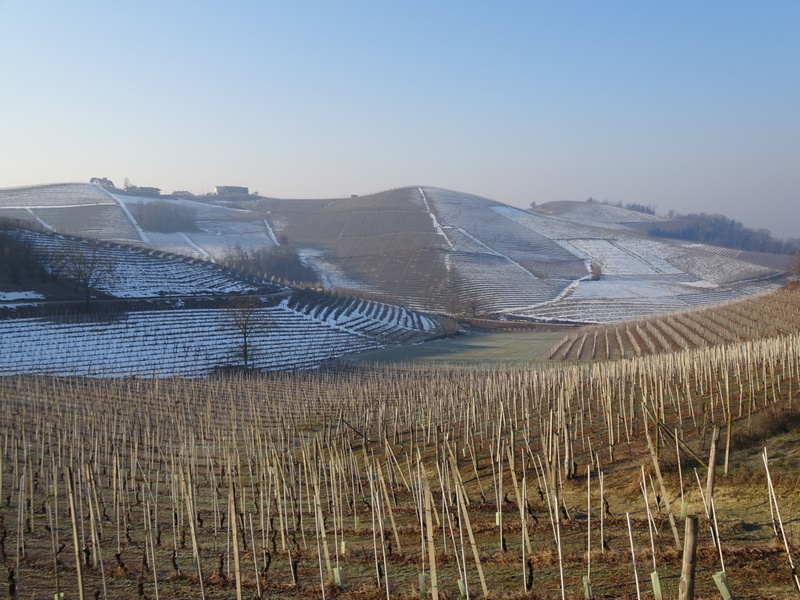 I look at the vineyards stretching away as I walk, empty and baren, half with snow clinging to the ground. I imagine them green and full of grapes, imagine the harvest, the wineries transformed into hives of activity. I imagine the bottles of wine that will roll out one day, boxed and packed to ship off across the world, to sit half-drunk on tables between friends who haven’t seen each other in ages, to pour out at business dinners on company credit cards, to mark first dates, last dates, and wedding anniversaries, to give as presents to in-laws for the holidays, to stash in the cellars of connoisseurs who will only look at them for years before they pull out the cork, to fill out wine menus in fancy restaurants, to remind an Italian living far away of the taste of home, to disappear into the glasses of some drunk rich kids who don’t care and won’t remember they drank it in the morning. The thought of all those bottles moving across the world makes me smile, all the lives touched by the vines on these hills, all the glasses they will fill, the stories they will be part of. I wonder if the cold air freezing my beard will linger in the taste? If the patchwork of snowy shadows and sun-soaked dirt will touch the aroma? If the soil sticking to my shoes brings out a particular boldness in the flavor? I wonder, but I don’t really care. Posted in Europe North to SouthTagged ENS, Europe North to South, featured, thru-hiking, wineBookmark the permalink. Ah, yes, 2017 is a great year already, starting out!!! Great blog! Really nice essay, Daniel. Good ending.